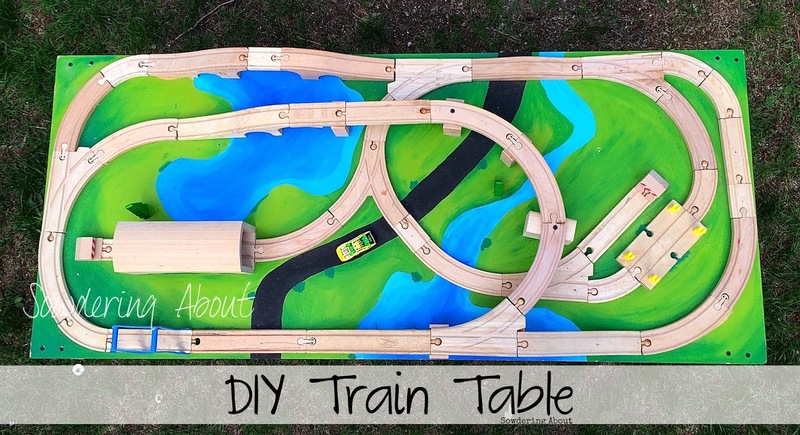 The first thing that you all need to know about this train table is that it's been over a year in the making! So why has it taken this long? Well, I made it, let the kids start playing with it and then in typical fashion, Dexter ripped it apart and I had to do a lot of fixing. 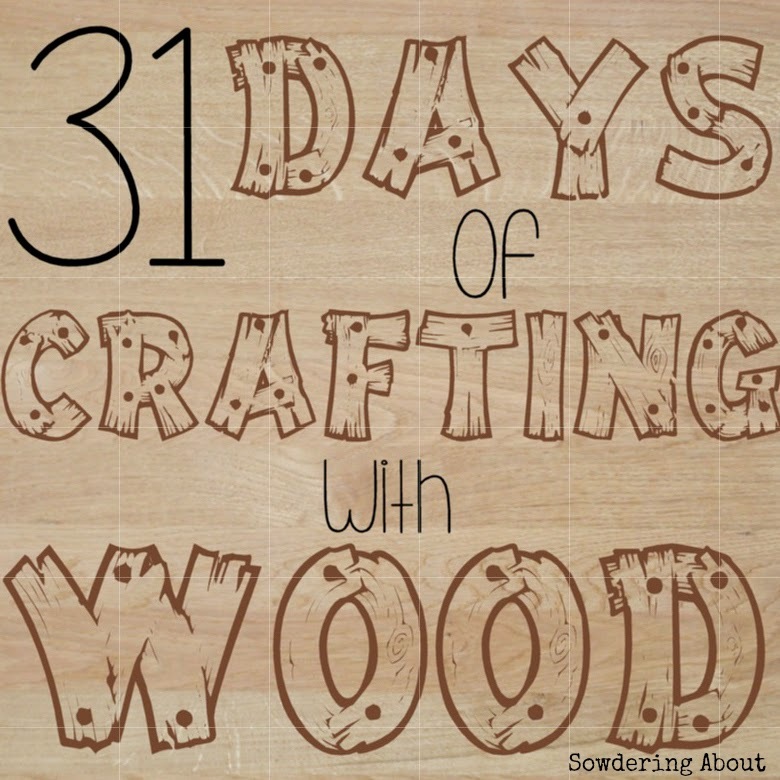 So I started in my natural way and grabbed the base piece of wood out of the scrap pile of wood in my garage. The train pieces I bought off a local swap and shop Facebook group for $15. 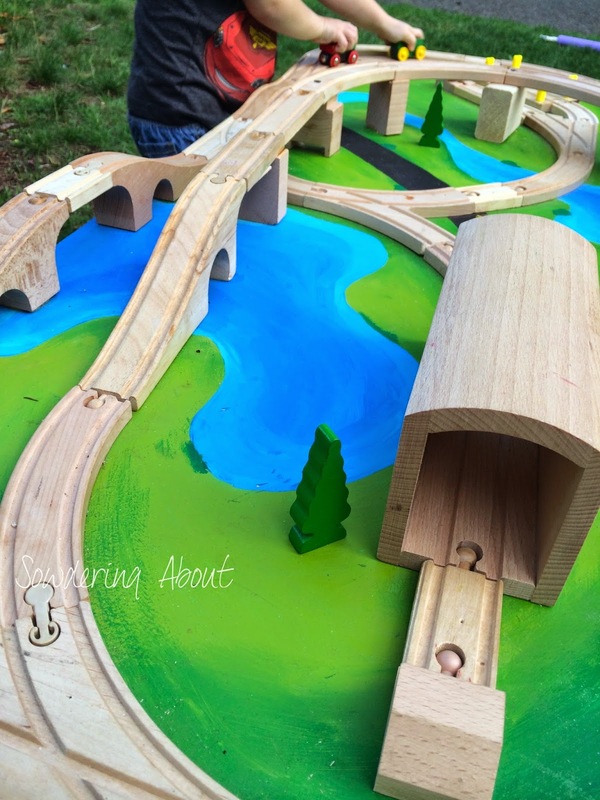 They are a mixture of IKEA, Melissa and Doug and BRIO tracks. Thank goodness they all mesh together well. I spent about an hour getting the set up correct. Matt asked me why I was even bothering to glue it down, but I did glue it down mostly because I didn't want to have to deal with a million pieces all over the place. 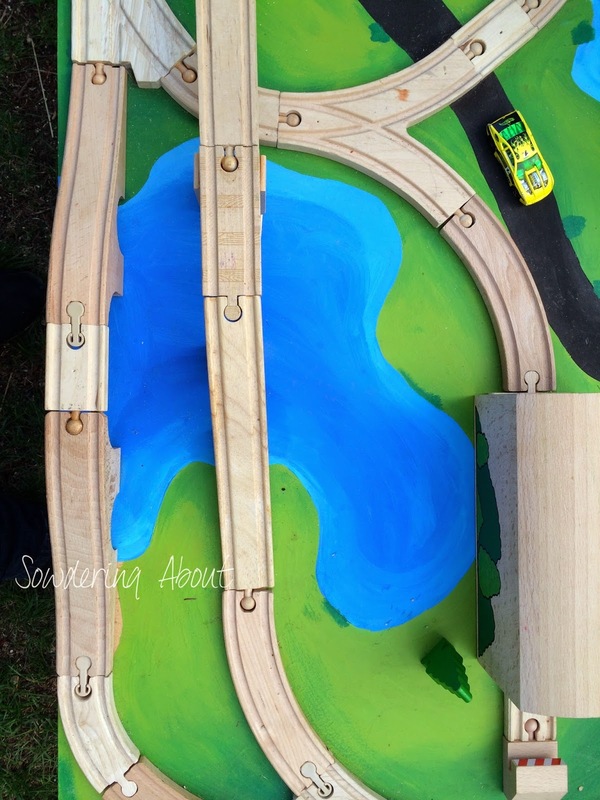 After I got the layout correct I traced the track onto the board and then sketched out where to put the river, the road and the grass. The paint I used for the base of the grass was the same paint I used on my Halloween statue. The dark green is just a tempera paint. When the green was dry, I started in with the water and the road. 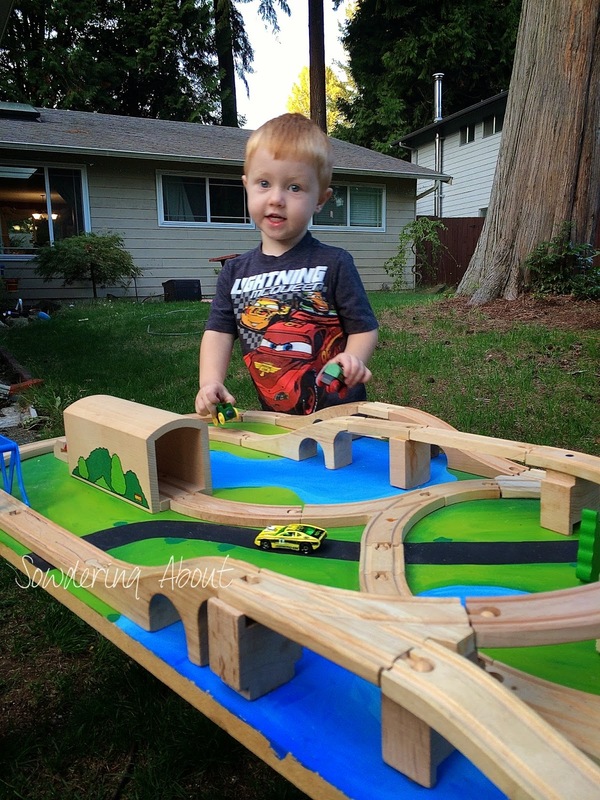 When that was all dry, I glued the track down! Then, see this is where I originally stopped. The idea behind this train track was to have it flat on the ground. That way it could be stored under the couch when the kids weren't playing with it. Well there were a few things wrong with that. One, when it was put away, the kids just flat forgot about it and stopped asking. Two, when it was out, we would trip over it. And three, because it was directly on the ground it got really dusty really fast. Dex would walk on it, etc and it's not easy to clean because of the detail with the tracks. So instead, I got some scrap 2x4s from the garage and screwed them onto the table to make legs. I also had to spend more time fixing and re-gluing the cracks down than I expected. I finally screwed a few of them to the table too to keep them in place. 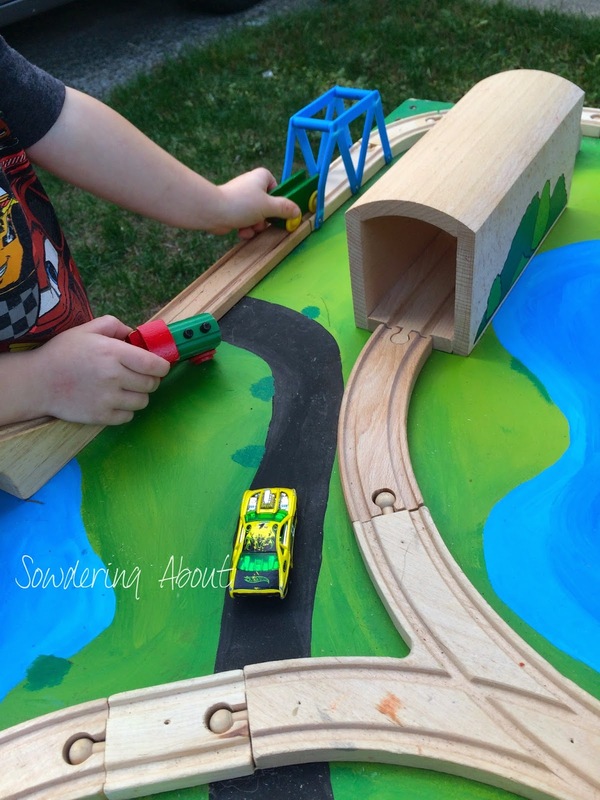 In addition to the fixing I had to do with this track, I had to fix the blue bridge, somehow Dexter ripped that completely OFF! 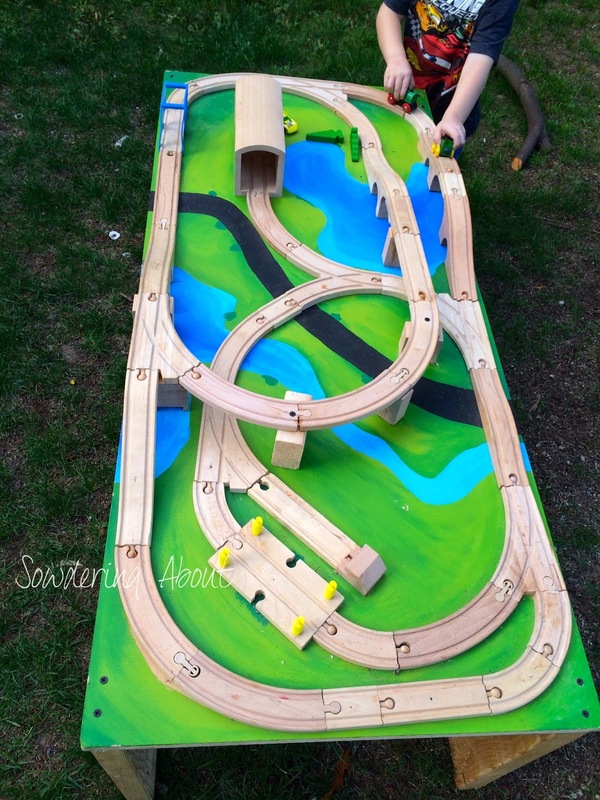 And I also picked up that BRIO tunnel at a consignment sale for $6.50. So I had to do a little shuffling with the track so I could make it work. I couldn't get a good picture of Dexter playing with it because he was so busy playing with it he wouldn't look up and give me a good smile! I also realized that I have to get him a new train set because he's lost all but two little train cars. He was happy with just those two though so I would have to say, this was a job well done! This is a really good one.........Makes me want to live next door to U!!! !.........Not so sure Matt would go for that one!! !